i want to merge the text data in four columns into one, can this be done ? The second argument in this example (" ") is a space character. You must specify any spaces or punctuation that you want to appear in the results as an argument that is enclosed in quotation marks. But I find it clunky for too many cells. Concatenate will work on a range. However, if you don't have spaces in your data and you have to add them, you can preferably use Concatenate twice. Firstly, create new data fields using concatenate(a1," ") etc, then Concatenate those new fields. "&" is fantastic for creating index fields to use later in complicated lookups. Like if you want to lookup by both date and some other attribute, just create a new variable. how #$%& good is trannies ! new years eve and still producing the goods. If you want to add a carriage return between the merged cols you can add CHAR(10) to tortoise's solution above. Ooh, I love it when I find a new excel trick! What's a carriage return, Grandad? LoL! Buy Grandad a beer and I'll recount tales of \r yore. Ah very good. I have a question too. I am looking for a formula to count shaded cells. Specifically I have a row where each cell is half an hour. I want to be able to shade individual cells in green manually but have them added into a separate cell to give a total as a number. For example if I shade 5 in the row I want it to show me the number 2.5 in a stand alone cell. I googled and found a formula but it does not auto update with changes. My advice is don't use shading for real calculation stuff. It's good for troubleshooting and tarting up stuff for an end user. Add another column where you flag the rows you are interested in using a formula that returns 1 for the ones you want to sum, 0 for the rest. Then do a sumproduct of your data col and the flag col. Simple. Will always refresh. That assumes that your shading has some numerical basis, ie < 3.5 or > average of the range, etc. If your green shading is manual, then also just enter a 1 in your flag col at the same time, but that's pretty crude and not sustainable in a big data set. As I read that... a function that returns the number of shaded cells in a range? Perhaps this can get you started in the right direction. Modify it to suit your specific needs. I've never been a macro lover so it's never the first option that springs to mind. In the workplace I've had one too many young turks who would write macros rather than using formulae, and then use them to stamp a whole lot of values into a data block. All very nice until they get it wrong and there is no-one capable of auditing and checking their work because the macros are so complex. This means either the mistakes are propagated if they are subtle or someone picks up that the results just don't look right. In a third party QA'd consulting environment, that is unsustainable. All work has to be checkable. This means that sometimes my spreadsheets get big, but you can always backtrack where something came from. I've never been a macro lover so it's never the first option that springs to mind. In the workplace I've had one too many young turks who would write macros rather than using formulae, and then use them to stamp a whole lot of values into a data block. All very nice until they get it wrong and there is no-one capable of auditing and checking their work because the macros are so complex. Yes, exactly as you say, there are risks involved with using macros, and standard programming practices should be applied to anything but the most trivial of functions. E.g. 'Comments should at least be used to document the author's intentions and hopefully be used to isolate any error. Macros are a very powerful tool, as they essentially give you access to the full object model of the application, but I've seen some god-awful macros in my time, typically written by someone with just enough knowledge to get themselves into serious trouble and not enough experience to know when they are doing just that. I worked as a programmer for 20+ years (I still dabble on the side) and so am perhaps more comfortable with the idea of macros. Nevertheless, I believe they should only be used when the built-in functions (essentially just macros written by Microsoft) can't do the job, and should be kept as simple as possible, so that they do exactly what they say on the tin. You can then manipulate or use the returned value in the excel function-bar, with standard functions and/or other custom functions, so that you can see the basic logic from the spreadsheet, and debug problems easier. i.e. Avoid writing monolithic "DoBlackMagic()" functions that require reading the macro to understand what the hell it does. e.g. In this case, the requirement seems to be count the number of shaded cells in a range and divide by 2? Rather than creating a function that returns half the number of counted cells, I would rather create a function to simply count the number of shaded cells, and then divide that by two in the excel formula-bar [ =ShadedCells(range)/2 ] so that the logic for the cell value is viewable from the spreadsheet. thanks. That is a fair bit beyond my knowledge. Let's say the cells are a1-h1, exactly what do I gave to insert into the cell that I want the answer to appear? This is the other reason why I don't use macros, because for a mid-range excel user, there are too many leaps into the unkown. Plaz, try the formula option if you've never done macros before. If you don't know how to write the formula, post back a word description of your criteria for shading the cells green and someone will be able to write it for you. Let's say the cells are a1-h1, exactly what do I gave to insert into the cell that I want the answer to appear? However, keep in mind that Excel doesn't consider fomatting to be changing the value of a cell, and so doesn't trigger the event to auto-update cells... you will still need to 'touch' the cell to update it. Of course, there are ways around this (off the top of my head... perhaps adding Application.Volatile to the function and adding a Calulate event to the sheet area) but it sounds like that may be too advanced for you. In which case, Tortoise probably has the KISS solution. Yes, way too advanced. The specific thing in need is to count cells that I manually shade. Let's just say I have 10 cells in total a1-j1 and I want the total number of cells that I manually shaded by using fill divided by 2 to appear in cell m1. What do I put in m1? You could perhaps approach it from the other direction. Manually enter a value (e.g. 1) into the cells, so you have a value that you can easily count and calculate with. Apply a conditional format to all those cells, so that if a cell contains a value > 0 then it automatically shades it and sets the text colour to the same as the shade (so you can't see it). Not perfect, but perhaps easier to manage. Hah. I like it. Will give that a shot. A row with a drop-down of YES/NO options (this can be adjusted to anything you want) above the 30 min time slots, and then selecting this to YES highlights the time and then does a calculation. This involves using the in-Excel option of Data Validation (making the drop-down), and then Conditional Formatting to adjust the color (doesn't impact calculations, but makes it easier to read). Then work the formula from the "YES" fields, something like: =COUNTIF(B2:F2,"YES") and then use the result of this to multiply by the 30 minute slots (note, adjust for hh:mm:ss appropriately). Drop-down (just in case this isn't clear): when you click on the cell, it produces a vertical menu showing acceptable options to choose for the cell. If you want a template for the above, which you can then work from, let me know Plazbot and I'll email it to you. That would be fantastic! Messaged u my email. Example sent Plazbot,let me know if there's any problems with it. Lol. I started reading this and it reminded me how much I have forgotten, but also how much I don't know. Trannies is a funny site .... Just when I'm bored and not training there is always something in Sandbox to amuse. . Trying to use a date of birth to workout when the student would start Prep. Skel, set up a lookup table starting in A2 in my example. If it doesn't work, it's because the dates are being read as TXT inputs, not DATE inputs. PM me if this happens and I'll give you a fix. It involves one formula. AARRGHHH!!! formatting of my neat tables disappeared, but I hope you get the idea. The lookup table has the date in ColA, the entry year in ColB. Assuming a column of DOB dates (formatted as date) and a column with 'Prep" calculation. Where A1 is the cellref of the first date (cell must be formatted as a date) and the formula is entered into another cell on the same row. Then you can just copy the formula down the column, and it will update the references. Basically just IF() that falls back through the 4 start dates. Note: I assumed "Prep 2019". Many thanks - did a copy an paste XCom and it worked perfectly - I will take it to work tomorrow and plug it into the larger spread sheet. This new job is giving me an opportunity to extend my "limited" skills, but I like a challenge. There is probably a more generic way to do it - as it's essentially looks like the financial-year of a date + 4 ? Assuming that is the case, then perhaps something like this might work ?? Used the same way as the previous one. I hate auditing nested ifs and I avoid them like the plague because they can be so error prone. Like I hate auditing spreadsheets from peeps who don't know sumproduct. Yes, the first solution was just a quick & dirty, which implemented the specified conditions - it's nasty, ugly, and would need to be updated as new years are added, but it does give the required answer. The 2nd solution is better IMO, as (provided the logic is correct) it should work for any year... and the only purpose of the IF() in that one is for empty references. Yours is really obviously a programmer's solution to an excel problem - totally not a criticism, just an observation that it is code-think. Having managed unsophisticated users for a long time, I prefer to teach them stuff that they can pick up and use for other purposes. Lookups are a fantastic and much under-rated spreadsheet tool, because they are simple (if you understand the principle of exact or inexact matches - for most applications I just tell people they must add FALSE and they eventually work out why), they are AUDITABLE by just about anyone, and very hard to get wrong. Plus if you add MATCH and INDIRECT to the toolkit, you are really humming. I also reject spreadsheets that are given to me for audit where macros have been used to do stuff and stamp values. I don't mind that once the process has been vetted properly as it speeds up subequent analysis and reduces file size, but if you have to sign off on stuff that might land you in court, you need a rock solid audit trail. Geek time is over, back to some real work with my 60MB spreadsheet. Yes, it's funny how a spreadsheet can have a difference in philosophical approach: accounting vs. programming. I'm a programmer and always approach things from that direction, but I constantly have to 'negotiate' a middle ground between what seems perfectly logical and more elegant to me, and what is practical and usable for accounts/finance who requested a solution - more often than not, their 'clunky' solution gets implemented, because at least everyone can understand it - LOL. Just perfect for a real time bike tracking algorithm or "find my car" type app. I do consider myself to be proficient in multiple programming languages - all the usual imperative and declarative suspects, including the various Web 'languages' - but I use Excel (functions/macros) only when I get a request for an Excel solution, and otherwise avoid it like the plague. However, because Excel uses what could be loosely described as a rudimentary functional programming language, I find it easy enough to initially write the problem out in pseudo-language, and then go looking for the required Excel functions to substitute - or write a macro if I need to. So, to nest multiple conditions you simply substitute the else with another IF(condition, then, else) and so on and so on, and close all the nested IF functions at the end, Which excel conveniently colour-codes for you. So.... something like this might work... but obviously you need to fine-tune the references and perhaps the logic. You can also define range names, e.g. 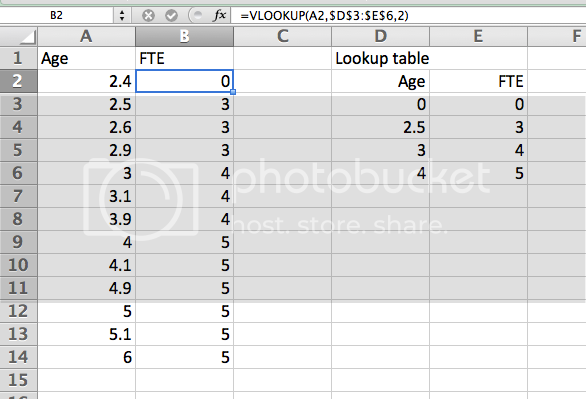 select all of column A and define it with than name "Age", and select the lookup table in D3:E6 and define it to be named "FTP_LookupTable". Just copy down the formula. What this does is look at the age value in column A, check that value in the first column of the lookup table, then returns the corresponding value in the second column of the lookup table. When an age value doesn't match exactly what's in the lookup table, it will choose the maximum value not exceeding the value being checked. In effect the table creates ranges. It's much neater than nested IFs, and especially if later you need to adjust the lookup table with modified ranges. It's a simple table change rather than getting messed up with nested IFs. Alex, that was my solution to Skel's first query. I'm a BIG user of lookups for all the reasons you outline. Even lower-skilled users can adapt them once given an example. I steer clear of names ranges because they are harder to audit and can trap the inexperienced end user. Will return an integer that matches Skel's list. MY WFH environment is a Win laptop with 2007 Office. I run a 2nd 21" monitor which is great for looking at contracts in detail and side by side comparos. I run everything from the laptop and use the 'Extend' function in Display to drag pretty much anything I want across to the external monitor. When I say nearly everything, except XLS that is. If I open with the laptop I cannot drag it across and even if open it from an application that is displayed on the external monitor (like Outlook for example) the XLS itself always 'jumps' back to laptop. This doesn't happen PPT, Word or anything else. Can you resize the Excel window down and then drag it across FP? Or does it not move, no matter what? That's how I used to do it Tyno, but it jumps back no matter nowadays, been doing it for about a week. I've probably hit some whacky setting when I've been rushing from one meeting to another. I can't do that between my excel in parallels on the Mac and the secondary screen either. But on some dual screen machines in my clients office I can, and on some I can't. Seeing as I play find the desk on a daily basis, I'm darned if I know why the difference. Edit, because I re-read your problem. On my Mac I can place excel in either window, but not stretch it across both. I'd thought of that, but with some data having more commas than others, how do I get around that? I need the text after the last comma in the 3rd column, the text between the 2nd last and last comma in the 2nd column, and everything before the 2nd last comma in the first column.